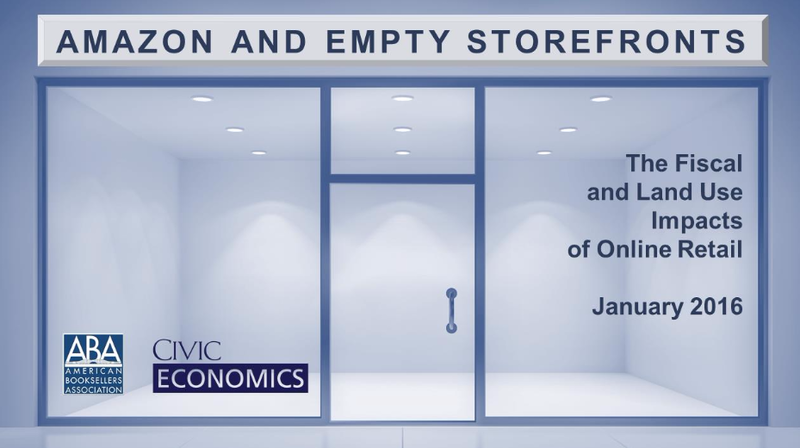 The American Booksellers Association and Civic Economics have long collaborated to study and describe the state of independent retail in America, but until now those efforts have focused on various classes of brick and mortar stores. This report takes that research into a new era. It is designed to provide policymakers and consumers with a better understanding of the impact at the state and local level of the growth of online retail as a substitute for storefront purchases. As Internet sales have risen unabated in recent years, little attention has been paid to the effects of that growth on American communities. 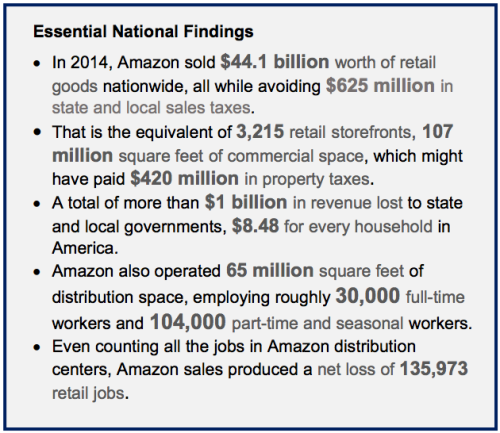 Focusing on the industry leader, Amazon, this report looks at two broad classes of impact: Fiscal (relating to public revenue) and Land Use (relating to development patterns at the local level). This report looks at calendar year 2014, the last year for which good data is available. Online sales have, of course, only grown since then. In addition, we focus exclusively on Amazon, which likely accounts for only 1/3 or less of total online retail. Given those limitations, these findings should be seen as a sign of far bigger impacts to come. The study also details specific findings for Arizona. In 2014, "Amazon sold $782.8 million worth of retail goods statewide, all while avoiding $20.2 million in state and local sales taxes. That is the equivalent of 550 retail storefronts, 1.9 million square feet of commercial space, which might have paid $7.3 million in property taxes. This results in $27.5 million in revenue lost to state and local governments, $11.53 for every household in Arizona." What this all means is that if these goods, that were purchased from Amazon, had been purchased from brick-and-mortar retail stores in Arizona then state and local governments would not have lost this essential tax revenue. Those dollars could then be distributed to public goods and services like schools, teachers' salaries, libraries, public safety, and other essential programs. On the jobs front, Arizona is home to an Amazon distribution facilities. Arizona is one of only eight states that experienced a net gain of retail jobs, a total of 4,632 jobs even though Amazon employs roughly 9,425 workers. That means that about 4,790 local retail jobs were lost in Arizona due to Amazon's sales and presence in the state. Although Arizona does experience a net job gain due to Amazon activity, it is important to remember what kind of jobs Amazon brings to the table (retail; warehouse), and that Amazon doesn't support other Arizona businesses at the rate that local businesses would. Amazon hires lawyers, graphic designers, consultants, marketing managers, and others outside of Arizona, so the secondary and tertiary impact to Arizona jobs should also be considered here. As we stated at the outset, this study should not be read as tilting at the vast windmill that is Amazon. As with the big box stores that preceded it, individuals and communities are likely prepared to accept tradeoffs for the convenience that Amazon offers. Amazon provides a valuable convenience, one that tens of millions of households (ours included) are willing to pay $99 a year to maximize. We do not believe, though, that Americans yet comprehend the nature of the tradeoffs to come. They may be asked to accept an increase of hundreds of dollars in annual household tax burden to pick up the slack from the stores they visit less often. They may be required to fund redevelopment efforts around struggling commercial districts and failed shopping centers, or to live with the boarded up storefronts. The already constrained job market for entry level workers will soon shrink further. As tax fairness initiatives have gained the upper hand to begin closing the sales tax gap in many states, those that remain will face an ever-widening sales tax gap and budget shortfall. We also hope this study will contribute to a reasoned consideration of the potentially more impactful land use challenges presented. American communities have adapted to monumental changes in the retail sector before, from the arrival of chain stores at the beginning of the 20th Century to the proliferation of big box stores at the end, but our adaptations have not always been successful. This wave of change, though, will go beyond who owns the store and how it is managed, it will see the store relocate to remote industrial parks and delivery vans. Managing these changes will be a defining challenge for 21st Century American communities. As the retail landscape continues to change, we at Local First Arizona think that technological advancements are great, but shouldn't compromise the types of communities that we value and want to live in. Studies have definitively demonstrated that money spent with local businesses circulates in the local economy at a higher rate, and consumers should support independent businesses at every opportunity. You can also visit the Local First Arizona local business directory for a list of local businesses who have online stores. To learn more about these important findings and see where Arizona stacks up against other states, you can read the study and find neat graphs and charts by clicking here.